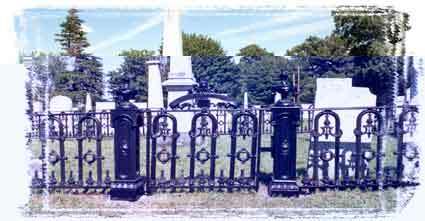 This nineteenth century cast iron fence is from a small rural cemetery near Rochester, New York. New Patterns and castings were made for about forty percent of the fence, which slopes up a gentle hill. Closely related to the previous is the subject of sub-contractors. If someone does not actually do the work, he certainly will not want you to visit his shop. If the company makes aluminum rowboats and does "restoration ironwork" as a sideline, the last thing he wants is you in his shop. Such firms do exist. In any event, if your project may entail sub-contractors, be sure they are responsible to the restoration ironworker. Most likely, you want to deal with one firm. You should not need to sqabble (or litigate) over who is responsible for what. 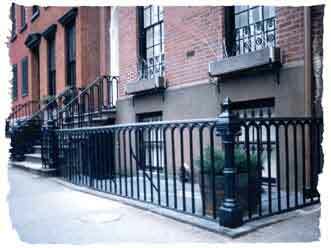 This light and graceful cast iron railing is a restoration of the damaged and deteriorated original. The window guards, while dissimiliar, are original and available though Architectural Iron Company. Specifications protect your interests and intents. They also protect our intent and reputation. Specifications should be detailed and cover all of your concerns. including paint removal, processes, means of attachment, and painting specifications. They should be written out clearly and completely in language you understand - rest assured the contractor does. The more general the specifications are, the more suspicious you should be. 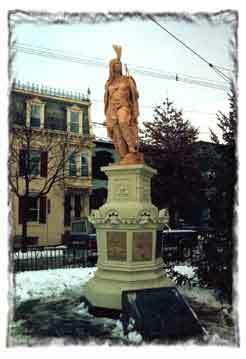 Architectural Iron Company's restoration of Lawrence The Indian in Schenectady, New York. This piece, standing some fifteen feet high, is a bronzed statue of zinc with a cast iron base which is originally, (and in the restoration) painted to look like sandstone.